17,000+ competitors lined up for today’s Walt Disney World Marathon. The 26.2 mile race through all 4 Disney theme parks was the final event during a weekend of races that saw nearly 54,000 registered runners and walkers toe the line in one of the events. For the full marathon, all eyes were on flamboyant Brazilian Adriano Bastos going for his 7th straight Disney marathon title (8th overall). 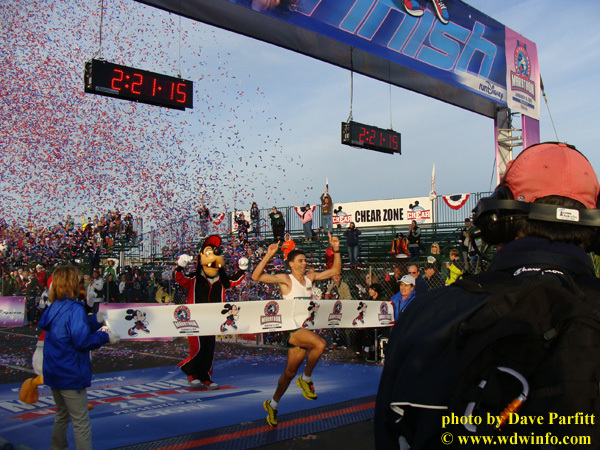 Bastos said after winning the 2010 Disney marathon he was shooting for 10 victories in a row. However, his Disney wish would not come true as fellow countryman Fredison Costa upset Bastos to win the signature event. Continue after the break for more details including photos of Women’s champion Leah Thorvison in her Tinker Bell inspired running wear. After Donald Duck and Goofy were done with their horseplay, the real winners started to arrive. Men’s wheelchair finisher Krige Schabort led the entire field, winning his 3rd straight Walt Disney World Marathon in 1:47:13. Shannon Schaffer of Kissimmee, FL took first place in the wheelchair division for women finishing in 2:47:39. However, the biggest surprise of the day was when the lead runner for the men’s division came into view and it was not defending chamption Adriano Bastos. Brazilian Fredison Costa won the race in 2:21:15, and ended Bastos’ streak of victories dating back to 2005. Costa nearly defeated Bastos in last year’s race - a tightly contested battle decided in the final 3 miles where Bastos took the lead and won by 33 seconds. Last year’s experience benefited Costa, and he was determined to return to dethrone the champion. “The weather was great and I knew the course very well after running here last year,” said Costa. Through the years, Adriano Bastos had become a crowd favorite at Disney receiving makeovers at Bibbidi Bobbidi Boutique, donning Goofy hats, and wearing MouseEars during the run. 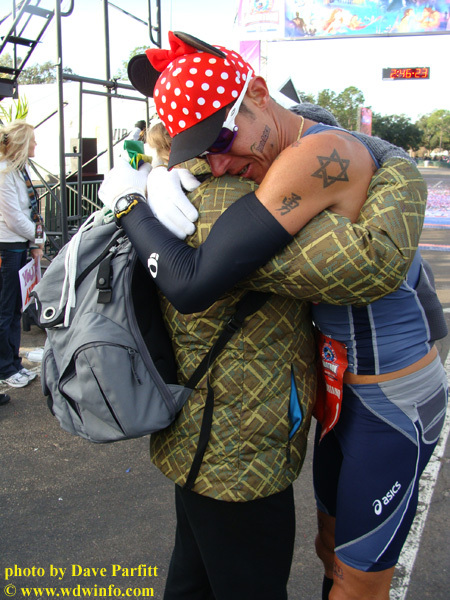 However, it became clear just how serious Bastos took the Disney Marathon and his streak when he broke down in tears after crossing the finish line in 15th place (2:45:09). Fans of Bastos’ fun-loving racing style do not have to look too far for the next Disney running personality. 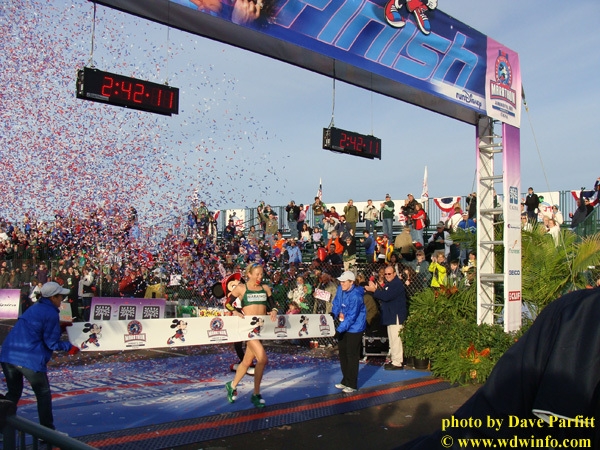 In fact, finishing just in front of Bastos was Women’s champion Leah Thorvilson from Little Rock, AR. Thorvilson (a 2012 Olympic hopeful) told Jon Hughes, race director for the Disney Marathon, she would run Disney this year because it fell on her 32nd birthday. She was true to her word, showed up in a bedazzled Tinker Bell running outfit complete with pom poms on her shoes, and celebrated her birthday with a victory crossing the line in 2:42:11. After winning the race, Leah was asked the traditional, if somewhat cliched, question “what are you doing next?” I’m sure the finish line announcer expected her to talk about riding Dumbo or tackling the Walt Disney World mountain range. Nope, she said, without hesitation, “I’m going to Drink Around The World!” In reference to having a drink at every country pavilion in Epcot’s World Showcase. For the first time, runners who completed the full marathon can use their medal to receive complimentary admission into one of the Walt Disney World theme parks on Monday, Jan 10. That includes the group of 5,000 runners and walkers who completed both today’s full marathon as well as Saturday’s half marathon as part of Goofy’s Race and a Half Challenge. All in all, runners from all 50 states and 60 countries took part in one or more of the Disney Marathon Weekend events. 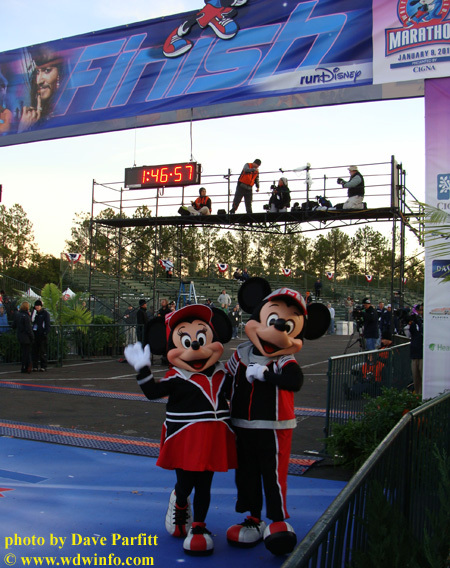 In 2012, Disney Marathon Weekend will take place January 5-8, and registration will open March 15, 2011. You can find more information to register for any of the Disney races on the runDisney.com webpage. The Wonder Moves West – Part 2: What exactly is a “vallarta”?